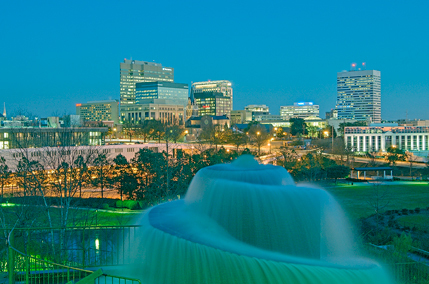 The Columbia Metropolitan area is home to nearly 800,000 people and spread over its approximately 132 square miles. While Columbia is the capital of South Carolina and serves as a business, governmental, and educational hub for the state, Columbia still retains surprisingly close unspoiled natural and rural areas for recreation and daily living. The heart of the City is the downtown area, steeped in an amazing history that spans hundreds of years and includes the early Native American settlements nestled among our three rivers as well as the dramatic burning of the City by General Sherman during the Civil War. As the seat of government and state capital of South Carolina, Columbia heats up even more when the State House is open for business with legislators from across the state heading to Columbia. Just a block away from the Capitol is the University of South Carolina’s flagship campus, home to the nation’s number one public University Honors College and the nation’s number one programs in International Business and International MBA. Having been named by the Carnegie Foundation as a top tier institution in both research and community engagement, USC is an integral part of Columbia, offering countless cultural opportunities each year as well as stimulating intellectual programs enjoyed by Columbia residents. Columbia is also home to our largest military installation, Fort Jackson, training over 50 percent of soldiers who annually enlist in the Army. In addition, Columbia is home to McEntire Joint National Air Base and nearby Shaw Air Force Base which is home to the Air Force’s largest combat F-16 wing. Recreational opportunities abound in Columbia, whether you are a distance cyclist looking for wide open spaces like Fort Jackson, with its seemingly endless roads for cycling or a fly fisherman looking to catch trout a mere five minutes from downtown. Love the thrill of sailing or hooking a big fish? Lake Murray offers nearly 50,000 acres and 600 miles of shoreline for unbeatable fishing and sailing. Home to three rivers, the Saluda, the Broad, and the Congaree Rivers, Columbia is a great destination for white water rafting or kayaking. During the winter, many prestigious colleges and universities take advantage of our warmer climate to get in early spring practices. Look for teams from Georgetown University, William and Mary, Bucknell, and University of Michigan, among others. Enjoy organized sporting events? It is no secret that Columbia supports its Gamecocks in all sports, be it the Lady Gamecocks playing basketball and earning a top ranking in the country or the Gamecock Football program with an array of such legendary players as Marcus Lattimore and George Rogers. In the spring, enjoy cheering on the Gamecocks at the state of the art USC Carolina Baseball Stadium, one of the finest facilities anywhere in the country and home to USC’s World Series Champions. Need still more baseball? Look forward to the opening of a brand new ballpark that will serve as home to a minor league team set to start playing in Columbia in 2016. On a smaller scale. Columbia also offers a very active tennis community and plenty of league play as well as abundant opportunities for youth, including soccer, golf, traditional sports, swimming, gymnastics, sailing, fencing, and martial arts.